What is Broken Link Checker? Broken Link Checker is the umbrella term for a set of tools & reports inside Ahrefs’ Site Explorer. Broken Link Checker will help you build stronger backlink profile just by 'fixing the web’. Use it to quickly find broken inbound and outbound links on relevant websites and turn them into your quality backlinks. You won’t need a pile of plugins, browser extensions and web services for your broken link building campaigns any more. Backed-up by the largest database of live backlinks and tremendous crawling speed of AhrefsBot, it is a perfect tool for getting information about broken backlinks across the web in one place. We update our backlink index every 15 minutes to make sure you always get up-to-the-minute broken link data. Finding strong backlink opportunities is really easy with this tool. A link that leads to an “error 404” page is called a ‘broken link’ (also known as a ‘dead link’). The most effective way to find quality broken link building opportunities is to get a list of your competitor’s 404 content pages, see who still is linking to them, and suggest your own content as a “fix”. Just plug your rival’s website into Ahrefs Site Explorer, go to “Best by links” report, and apply “404 not found” filter in “HTTP codes”. You will see a list of website’s “missing” pages along with the number of referring domains and referring pages that still link to them. 404 pages with the largest number of backlinks are most attractive for broken link building. To overtake a broken backlink, head over to Archive.org, check what used to be on a ‘dead’ page, and see if you have anything to offer as a replacement on your own website. Alternatively, when Archive.org can’t help, you can guess what used to be on that page from the anchor text and the text that surrounds it. You can see them in our tool directly. Then reach out to a webmaster or editor and suggest a link to your content as a fix. You will see the full list of web pages that link to a ‘dead’ page as you click on a number in “Dofollow” column. Sort this list by Domain Rating (DR) or URL rating (UR) to target the strongest backlink opportunities in the first place. If you know a website you’d want to get a backlink from, put it into Ahrefs Site Explorer and go to “Broken Links” report in “Outgoing links” section. You will see all the pages with broken outgoing links this website has. Sort them by URL Rating to target backlink opportunities from the strongest pages, reach out, and offer your content as a replacement. A more advanced approach will include batch analysis of these URLs in Ahrefs Site Explorer to find pages with the largest number of backlinks. Overtaking broken links from these pages will bring your content maximum “link juice”. Finding and fixing broken backlinks to your own website is probably the easiest way to get “link juice”. In fact, these backlink are already yours, but do not help your content rank anymore. 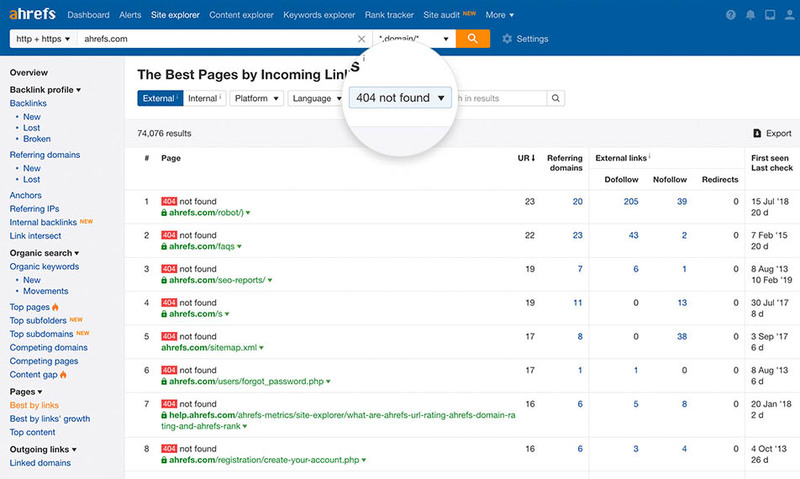 Simply put your website’s URL into Ahrefs Site Explorer, go to “Best by links” report, and apply “404 not found” filter in “HTTP codes”. Alternatively you can use “Broken” report in “Backlinks” section to see the strongest broken backlinks of your website. You can easily regain them by restoring the missing pages or by setting up proper 301 redirects. Apart from broken backlinks, you can find the broken outbound links on your website. It's not a secret they have a negative impact on your visitors' user experience, and thus need your attention. 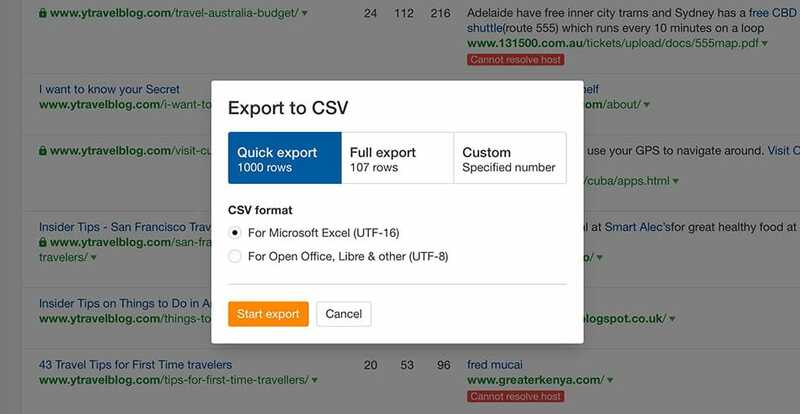 In case you need to store, operate, and analyze broken link and broken backlink data outside Ahrefs, you can export it to a CSV file in just two clicks. 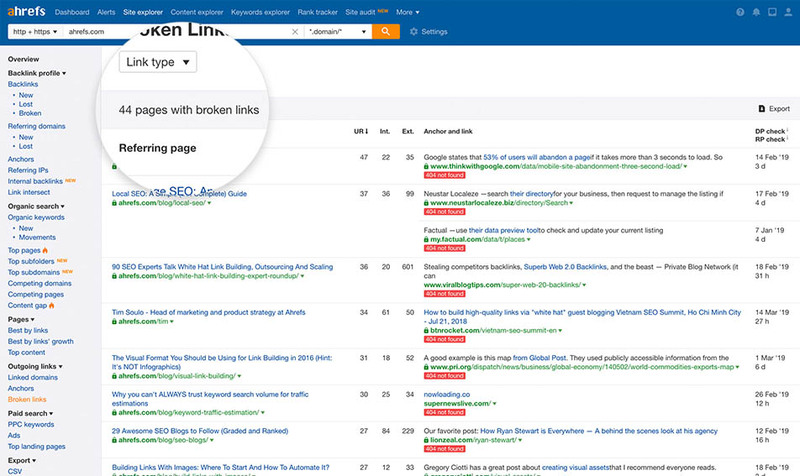 Start using Ahrefs’ Broken Link Checker tool and start fixing some broken links right now!